Storm-Beaten by Robert Buchanan. The scenic designer was E. W. Goodwin. Jabez Greene, the shepherd, was played by H. Beerbohm Tree. Mrs Christianson was played by Mrs. John Billington. This powerful melodramatic play, which Mr. Robert Buchanan has constructed from the story of his striking novel recently published under a different name, continues to prove interesting to the popular audiences at the Adelphi Theatre. It seems intended to be a forcible illustration of the futility as well as impiety of cherishing an implacable purpose of revenges for the most enormous personal injuries. 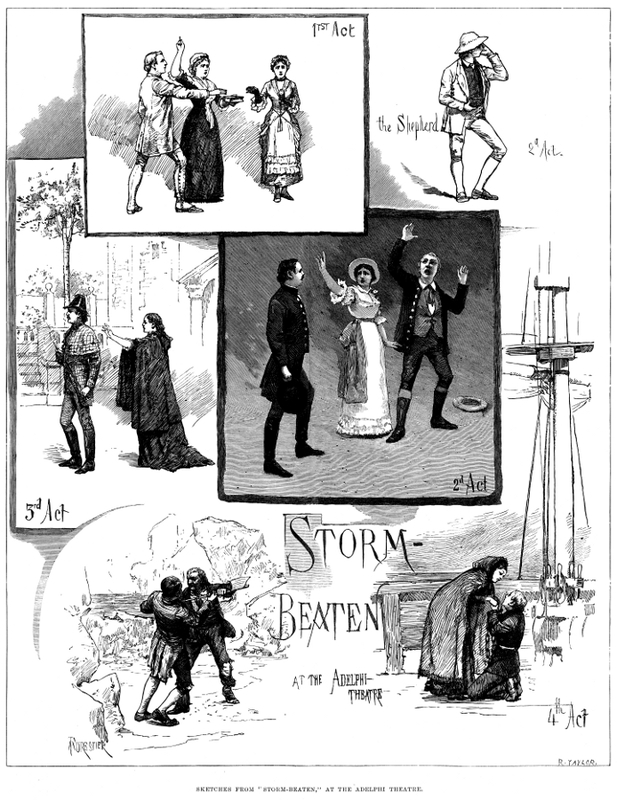 We see that the hero, Christian Christianson, while pursuing on the high seas his design of vengeance upon Richard Orchardson, the seducer of his sister Kate, and his rival in the affections of Priscilla Sefton, is thrown by shipwreck, together with the villain above-mentioned, on a desolate Arctic shore, where they share the prospect of a miserable death, and are deprived of the inducement to gratify their mutual hatred by killing each other. Mr. Charles Warner in the part of Christian, and Mr. Barnes in that of Richard, act up to the intense spirit of enmity, in this prolonged duet of aggravated ill-will, with considerable force of expression; while the distressing position of Kate and the innocence of Priscilla, respectively performed by Miss Amy Roselle and Miss E. Lawrence, bring into sufficient prominence the play of feminine affections. Mr. Beerbohm Tree's amusing representation of the silly shepherd, Jabez Greene, gives some relief to the exhibition of woes and wrongs and tragic passions; and the scenery, painted by Mr. Beverley, affords some grand pictorial effects. 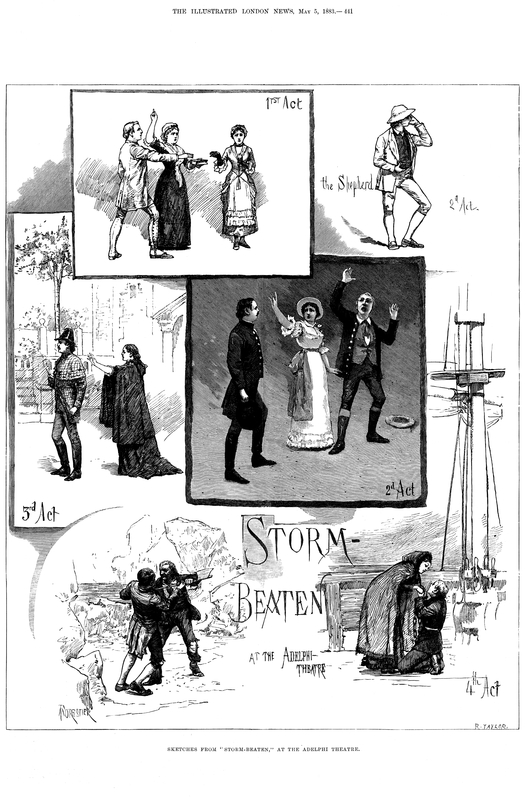 Our sketches of "Storm-Beaten" are a delineation of some of the notable characters and incidents of this dramatic romance as shown upon the Adelphi stage. In the first, Act Mrs. Christianson is represented obliging her son and daughter to take an oath that they will avenge the family wrongs; the other scenes will be recognised by all who have seen the play or read the book, and those who have not may do so if they please. 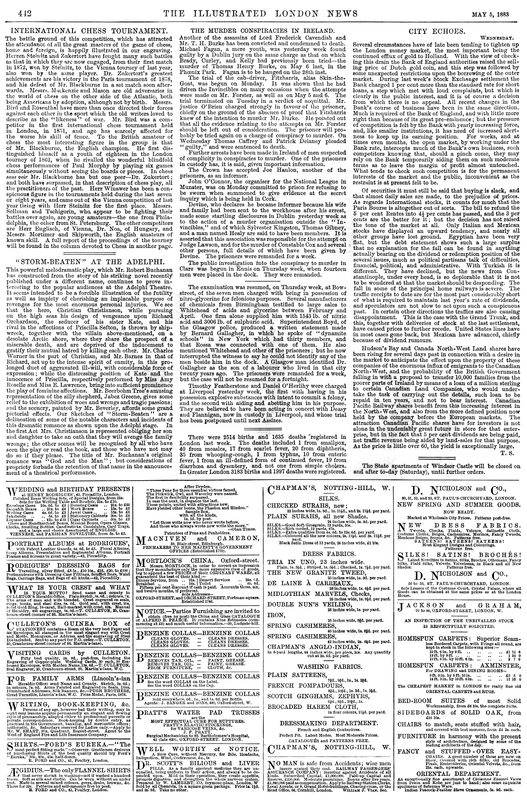 The title of Mr. Buchanan's original romance was "God and the Man"; but considerations of propriety forbade the retention of that name in the announcement of a theatrical performance.